Find out if a Diabetes Coach is Right for you: Click HERE and Fill Out the Quick Diabetes Dominator Coaching Questionnaire to Get Your Free 20 Minute Coaching Consultation! What is a Diabetes Coach? I offer health, fit ness, and emotional wellness coaching for people with diabetes and without through our comprehensive programs. As a Diabetes Coach, Bestselling Author, Health Coach, and Certified Personal Trainer, with a bachelor’s degree in nutrition science, I make it my mission to help you achieve your goals and see results faster then you can on your own. No matter what stage of life you are currently in, one-on-one coaching will provide you with the guidance, accountability, insight, training, and focus you are currently missing that is keeping you from reaching the goals you have been working towards. Coaching is key for guidance, accountability, and ultimately, attaining the results you’re after. Diabetes Dominator Coaching is not based on hope or on guesswork. It is designed after those who have already achieved the real results you desire through coaching at a higher level. You will work with me and my team directly, and we will tailor your plan to match your individual needs and goals. We will help you measure, track, manage, and support the specifics of your diabetes to ensure that you keep your word to yourself, to me, and to your loved ones who you want to live a long, healthy, happy life with. If you are struggling with everyday diabetes management, what would it mean for you to be able to completely transform your relationship with diabetes, particularly your thoughts and feelings about diabetes, in the next 8-12 weeks and then carry that forward for the rest of your life? How immensely would your overall quality of life improve? How much more happiness, joy, confidence, empowerment and freedom would you feel? How would your relationships improve, both with yourself and with others? This is what a Diabetes Coach, and more specifically, Diabetes Dominator Coaching offers. A customized, tried and true plan designed after those who have already achieved the sustainable results you desire (including myself, T1D for 25 years that has gone from obese with an eating disorder and deep depression to an nutritionist, certified personal trainer, and athlete who lives the life I only imagined possible back then) through coaching at a higher level that can and will change the quality of your life in just 8-12 weeks. This will only work if you are ready and willing to take action, learn, make mistakes, and try again despite falling down, all while loving yourself and giving yourself the credit and appreciation you deserve. If you don’t know how to do that yet, I will teach you! ACCOUNTABILITY: One 30 minute phone call per week where we will check in on your progress in order to monitor your improvements and keep you accountable and on track for success. I will also be available by email to answer any and all questions you might have along the way, even on the days we do not have scheduled sessions. No longer accept feeling like a victim to diabetes! Learn how to take control of your practices and choices that shape your day to day reality – for good! 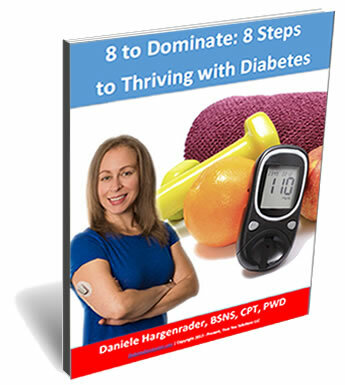 A REPEATEDLY PROVEN SYSTEM FOR SUSTAINABLE CHANGE: Thousands of people with and without diabetes have gone through my Six Pillars of Total Health system that I created from the ground up based on what I know people need to have a basic understanding of in order to live a joyful, healthy life – mind, body and spirit. Included in the coaching program, you will have access to a syllabus (much like a college course) that contains weekly information, assignments, and worksheets all designed to guide you through the program and to meet you exactly where you are. There is no “falling behind” as all information will be available to you for life, and most clients continue to go through the materials long after their coaching programs have concluded. TOTAL HEALTH TRANSFORMATION ACADEMY: Online log in/access to your own members portal of Total Health Transformation Academy, the wildly successful online course created by Daniele that has helped countless clients and students to truly understand what it means to be healthy, mind, body, and spirit. The online course teaches the Six Pillars of Total Health, including SUSTAINABILITY when it comes to our health habits. No quick fixes, pills, or potions. There is no other online health and wellness program like it available today. All wellness programs cover nutrition and fitness (which we cover extensively in this course), however they never address the number one factor that affects our ability as humans to make and sustain changes in our lives: our MINDSET. Total Health Transformation Academy teaches us how to harness the power of our mindset to help us create the optimal, sustainable levels of health we have always wanted but have never been able to maintain permanently. HOW TO HANDLE THE MENTAL/EMOTIONAL PRESSURES: Having diabetes is difficult, there is no doubt about that. I will teach you proven methods on stress reduction, how to reduce the pressures of living with diabetes by your power of choice, self-love, community and physical movement. Remember, I can teach you how to do these things, but only you can take the actions required (practice) to obtain the benefits of these stress reducers. We all have the power to turn adversity into advantage if we so choose! PERSONALIZED NUTRITION GUIDELINES AND AN INSANELY EASY WAY TO STAY WITHIN THOSE GUIDELINES: Personalized myfitnesspal.com account set up with individualized daily goals for all macronutrients that I will set for you based on your specific needs and goals showing you exactly where you need to aim to be each day so there is no guesswork involved regarding what and how much to eat. Logging your food and liquid intake daily and HONESTLY is a mandatory, crucial requirement of the program. WHAT TO EAT: Simple, healthy recipes to incorporate into your daily life that I have either created or tested and approved. Being happy and satisfied with what we eat means we will continue to eat healthy and create sustainable nutrition habits. HOW TO MAKE COOKING QUICK AND EASY: Top healthy and unhealthy food lists for shopping and pantry clean-out. Having delicious foods on hand that are ready for us all week long is key to creating sustainable healthy eating habits. Equally important is NOT having unhealthy foods in our home at arms reach. Failing to plan is planning to fail! EXERCISE: Six 10 minute workouts (videos in the Total Health Transformation Academy online portal) that are easily modifiable to any fitness level. I am a certified personal trainer and will make sure you have any and all questions answered (as long as you ask!) so you can work out safely and confidently. 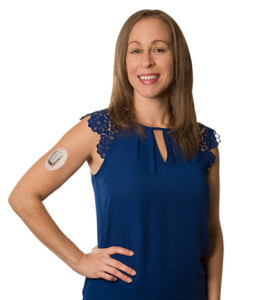 CGM AND PUMP COACHING: If you are currently using a continuous glucose monitor and/or an insulin pump, I will give you tips and tricks to customize your settings to maximize your ability to keep your blood sugars in optimal ranges. Having the incorrect basal/bolus settings can be the deciding factor on whether or not we succeed with keeping our blood sugars where we want them to be. A la carte diabetes coach services: Any of the above bullet points that you feel you need help with, tailored to one-on-one 30 minute sessions. If you are interested in coaching (Diabetes Coach, Health Coach, Nutritional Coach, etc) and taking your diabetes management to the next level for good, fill out the short questionnaire HERE and we’ll schedule your free 20 minute coaching consultation. *Disclaimer: I am NOT a medical doctor. Diabetes coach services are based on years of evidence based results obtained by working with myself and thousands of students and clients, and the consistently proven and repeatable results we have achieved together. ALWAYS consult with your doctor before changing your health regimen in any way. Virtual Diabetes Coaching: Though I am based out of Philadelphia, 99% of my coaching is done virtually and I’m blessed to have the opportunity to work with people from across the globe. When you’re ready, we’ll make meaningful and sustainable progress over the phone, video conferencing, and through online training you can take from the comfort of your own home. Fill out the questionnaire to get started.